( April 21, May 3, 2005). Dr. Anil Srivastava MD (Cardiogiost) and Dr. Mrs. Renu Srivastava DGO organized three days discourses of Rev. 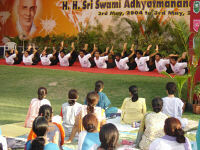 Sri Swami Adhyatmanandaji at Lucknow King George Medical College and Queen Mary Hospital. Then Rev. Sri Swami Adhyatmanandaji went to Dehradun for Sri. Swami Chidanandaji Maharaj's darshan. Rev. Gurudev was in delicate health for previous four days. HE expressed His gratitude to Swamiji for traveling all the way from Ahmedabad to see the decaying body. As per Sri Gurudev's instruction, Swami Adhyatmanandaji visited Sivananda Ashram, Rishikesh and had darshan of Holy Master Sri. Swami Sivanandaji Maharaj at Samadhi Mandir. Rev. Sri Swami Vimalanandaji Maharaj, General Secretary of DLS HQ welcomed Swamiji. After over night stay at the Ashram and morning worship at Sri.Vishwanath Temple, Swamiji return back to Ahmedabad. On his way back Rev.Swami Adhyatmanandaji paid his homage to Sri Sri Anandamayi Ashram, visited H. H. Sri Swami Vishwadevanandaji Maharaj & had a darshan of Maha Mandleshwar Sri Swami Satyamitranandaji Maharaj at Haridwar. Also hearing the news of Maha Mandleshwar Sri Swami Ganesanandaji Maharaj, attaining Maha Samadhi Rev. Swamiji attended last rites of the departed soul. Sivananda Ashram. A'bad organized a week long residential camp for children. Ninety four children attended the camp. 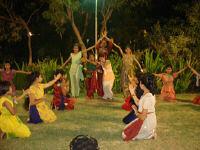 It concluded with grand cultural show by the children and attended by all parents and guardians. Nine hundred novice attended the camp in early hours of morning from 5.30 am - 7.00am. All the participants of this camp were blessed by H. H. Sri Swami Tejomayanandaji Maharaj, President of Central Chinmaya Mission Trust. 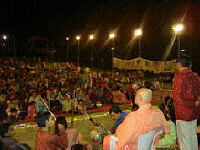 At concluding ceremony H. H. Sri Swami Vasudevanandaji Maharaj of The Divine Life Society, Calcutta was present.